Hello everyone! I created a birthday card for the 126th Lawnscaping challenge 'Sweets'. I used the new, absolutely adorable 'Loveable Legends' stamp set from Lawn Fawn along with other products of the company. 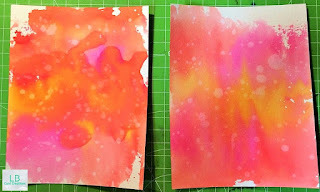 First I created a watercolor background using distress inks. I used greens and blues so that it looks like grass and the sky. I also die cut a piece of green watercolored paper (using the same greens) with the 'grassy border' die. 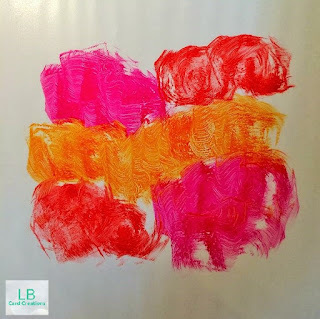 Then I used the second largest die from the large 'stitched rectangles' for the background. I stamped and colored the images with Copic markers and cut them as well. For the sprinkles of the donuts I used matching Lawn Fawn die inks. After that I could assemble the images and created two further layers for my card. First a piece of white cardstock which is a little bit bigger than the watercolored piece and second a mermaid line-dance patterned paper which I die cut with the largest of the large stitched rectangle dies. I adhered the pieces with double-sided adhesive and added the sentiment with a black ink. I used the loveable legends stamp set and the word 'sweet' from the older 'milk and cookies' stamp set for that. Thank you for stopping by and I'll see you soon. 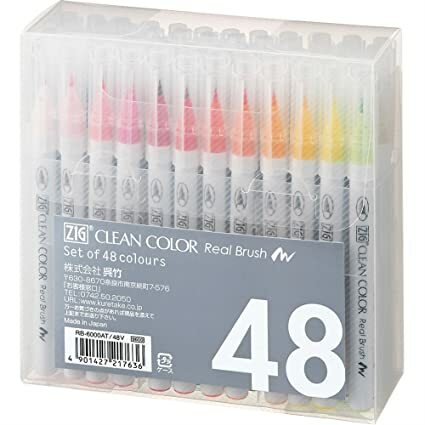 Copic Markers: BG10, BG15, E30, E31, E34, E35, E37, E50, G12, RV000, RV52, Y000, Y11, YG11. Hello! It's me again with a pair of cards featuring 'Space Bears' from Mama Elephant. I used the set two or three weeks ago and created a galaxy for the background. This time I wanted a brighter version and decided to use pinks and orange for the sky. I started by smooshing distress ink pads (spiced marmalade, picked raspberry and barn door) onto a piece of laminated paper. I let that try and stamped and colored in the space bears with copic-friendly ink and copic markers. After die cutting them I coated the helmets (?) with glossy accents. I also die cut the clouds from white glitter cardstock and vellum. For the balloon from the 'Rainbow High' set I used water color paper again. I added dried marigold and spiced marmalade distress ink to the balloon to match the background. 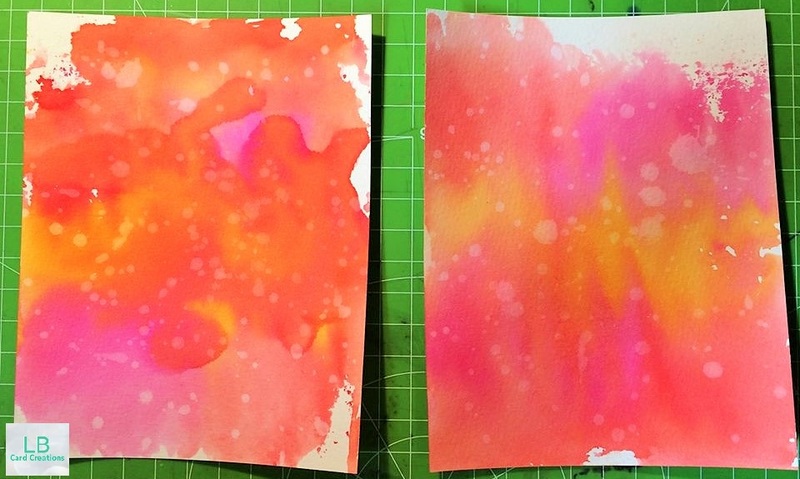 Before assembling the cards I sprinkled some water droplets on the water color pieces to get the famous distress look. The sentiments are from the same stamp set. I adhered the clouds with double sided adhesive and used foam tape for the balloons and bears. For the string I grabbed a piece of grey/white twine from my stash. Last but not least I added sparkling clear sequins in 4 and 6 mm. Thank you for stopping by and have a nice Easter holiday! Hi there! I am finally back with the last Easter card for this year. I used the brand new stamp set 'Best Easter' from Clearly Besotted as well as different stamp sets from other awesome companies! I startet by die cutting a circle from a piece of pale green cardstock using the 'sew fancy' die set from Mama Elephant. Than I used two different egg stamps and one butterfly from Easter Lawn Fawn sets along with Versamark ink. I heat embossed the images with clear embossing powder to get that tone on tone design. With the distress ink shabby shutters I darkened up the edges of the green cardstock to get more definition. 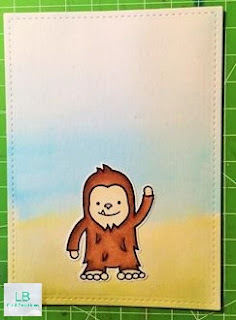 Then I prepared the pastel yellow cardbase by blending some white Yeti pigment ink from Lawn Fawn. I put the background pieces aside and startet with the cute images from Clearly Besotted and the adorable rabbit from 'Lunar Animals'. I stamped them with Archival jet black ink onto watercolor paper and colored them in with my Zig Clean Color Real Brush markers. I covered the balloons with glossy accents and let them dry. Then I assembled the card by adhering the embossed piece of paper with double sided adhesive and the images with foam dots. For the sentiment I used the greeting included in the set from Clearly Besotted and stamped it onto a piece of Lawn Fawn pattern paper (Hello Sunshine collection). Again I used foam dots for adhering the banner and added some enameld dots. Have a nice day and thank you for stopping by!